The oldest family name in Chicago-style pizza, Lou Malnati’s has been the Chicago-style deep-dish pizza for more than 34 years. 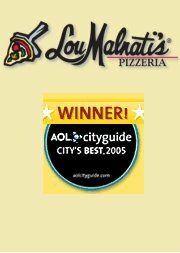 From the first restaurant established in 1971 to the 22 current locations, Lou Malnati’s has focused on food quality and customer service. a full service family restaurant committed to reinvesting all of the profits back into the community. All profits will be given back to the community to benefit children's educational and recreational programs. As Lawndale's only sit-down restaurant, the place was meant to be a beacon -- attracting other businesses to the downtrodden urban landscape. Maybe it has, but change comes slow. There's a new strip mall, expanded health clinic and slow-sprouting condominium buildings, but no pizza-fueled business boom. And they say it's added to the quality of life in Lawndale, a local spot finally suitable for a business lunch or family birthday party. But the reality is that maybe "Lawndale isn't ready for upscale pizza," LCC pastor Wayne "Coach" Gordon admitted. Most neighborhood folks just don't have much disposable income for deep dish comfort food. In 2005, the average household income in Lawndale was just $21,200 compared with the citywide average of $40,800, according to the Metro Chicago Information Center. What folks do have, Gordon says, is hope. From time to time, Malnati's top bosses talk about closing up shop and offering up profits from the other 23 locations to community groups rather than continuing to eat the yearly losses. So far, they've decided the casualties of closing -- the guys who turned their lives around working there -- are more important than the lack of profits. "It's pretty emotional. I can't stop thinking about what would happen if we decide to stop doing this. Who's going to be on these guys' side?" regional manager Jim D'Angelo said. "The numbers we've helped aren't huge. I can't say we've helped hundreds or thousands . . . but I feel we can't give up on them. Who else would create this opportunity for them? We don't consider it losing money. It's an investment in the community." At the front of his mind are guys like assistant manager Jermaine Hill, a recovering crackhead who turned his life around at Hope House. "In Chicago, I found my way to Cabrini Green. . . . I was stealing, hanging out with people who steal, selling drugs for a little while, begging. I was a great beggar," said Hill, 34. "People in Chicago were great. They always gave you money. There was just never enough drugs." A chance meeting with a pastor led Hill to Hope House six sober years ago. He dedicated his life to God, and as part of the back-to- work program started working for free washing pizza pans. He worked his way up to busboy, server and now assistant manager. "I wouldn't have been able to get a job anywhere else. And I wasn't even looking for one. They accepted me on my word. I didn't even have an ID," he said. "I've been able to save up quite a bit, pay off old debts. My main goal now is to get a home, keys to my own home. "This Malnati's might be losing money, but they're saving lives. Helping grown men like me get back on track. What's that worth?" Over the years there's been dozens of guys like Hill at Malnati's in Lawndale. A few have moved up in the Malnati ranks, others used their experience to score better jobs with other companies such as Starbucks. "It's not a business that makes tons of money and funds youth programs and all kinds of good things like the Malnatis hoped. But it's working in another ways. It's helping men get their lives together," Gordon said. And not just guys who are down and out. D'Angelo said the Lawndale restaurant changed him forever. "I thought it would be about me giving to guys who needed a chance. I was told I was going to give and support them, but they gave to me," he said. "In the process I received the greatest thing in life, my faith in Christ." An ex-con named Sam Jones who worked as a cook at Malnati's befriended D'Angelo and invited him to a Bible study. "It was a guy who was in prison that helped lead me to something good in my life. Something that made me a better man, better father and better husband," D'Angelo said. "That does emotionally attach me to the store. And it's one of the reasons we still do it. It's an investment in people. It's there to help people make better lives for themselves." The restaurant's future remains uncertain, but business seems to be looking up as new condos and businesses sprout in the area. Hope survives. "We've started to deliver to homes, which wasn't an option in the past because we thought it was a threat to our drivers," manager Linda Matthews said. "I know it's been 11 years, but I see us doing a lot better."